Mountain biking is a great style of exercise, as well as an excellent way to see the sights of a given region. Anyone can bike, kids/women/men alike. 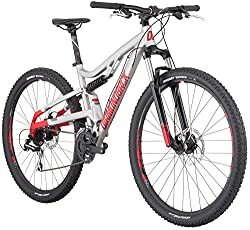 However, before you go down to the sporting goods store and grab the first bike you come into contact with, it’s essential that you take some time to research the best mountain bike. That is why we are here. In this focus article, we will take a detailed look at every aspect of this sport. We will begin by discussing the necessary gear that every biker needs. The second part of this article is where we will outline the types of bike out there and what you will need to know before buying one. Then we will discuss a few basic care tips for your new bike. After that, we will review the top nine mountain bikes on the market for 2019. Are you ready to get started? If so, put on your bike shoes and follow me! Cycling is not all about the bike. In fact, before you even get a mountain bike, it’s important to make sure you have the proper gear. Sure, you could just go cycling in whatever clothing you happened to be wearing, and some disciplines do. However, that might not be the most comfortable or safe. Therefore, we are going to help you pick the right gear for this sport. Your shoes are arguably the most important piece of gear any cyclist has. After all, when seated on a mountain bike, you have just three points of contact. If you stand up, which you will frequently do, the number of contact points drops to two. The last thing you want is for your feet to slip on the pedals. There isn’t just one type of shoe that’s best for everybody. Your pedal preference, preferred terrain, and even weather conditions play a role here. So, how do you choose the right shoe for you? The key is first to pick your type of pedal. Mountain bike pedals come in two types, flat and clipless. Flat pedals don’t require special shoes, though flat-pedal biking shoes will work much better than your typical tennis shoe because the sole is flatter and the rubber is stickier than typical tennis shoe rubber. Most flat-pedal bike shoes look like overbuilt skate shoes and have a variety of fasteners. Many models have laces, but some have Velcro straps or boa laces. If your shoes have laces, be sure to tuck the ends securely away. You don’t want them catching your pedals or your drivetrain. Clipless pedal bike shoes are used in almost every type of biking, so there is a great amount of variety in them. Most, however, are much stiffer than a flat pedal shoe or your typical tennis shoe. Furthermore, they have a recessed area for installation of cleats. Intro-level shoes tend to use a nylon shank for stiffness. High-end shoes use carbon fiber shanks instead, as they are much more durable. Flat pedal shoes are much better if the weather is cold. They are less vented, and the soles are flat which means you don’t have the heat sync effect of a cleat. In summer, the opposite is true. The vents on your clipless pedal shoes will draw heat away from your foot, and the vents will keep your toes nice and cool. It is best to get your bike shoes from a local store. Walk around the store with the shoes on. Pay attention to any discomforts. It may be tempting to say your shoes are good enough, but any discomfort will be compounded on a long ride. Also, your socks affect the fit of your shoes. Make sure to wear the kind of socks that you plan to ride in when going to the store to pick out your shoes. Going biking without gloves may be tempting. However, that is a bad idea. Your hands are an important point of contact. Rain, sweat and many other things can make your handlebars slippery. Because of that, you run the risk of making an avoidable mistake while riding that could cause you to crash. When picking your gloves, go for ones that have a gripping surface on the palms. That way you can ensure a firm grip on your handlebars. Also, make sure there is padding in the palms. That way, you can avoid blisters and stress injuries that occur over time. The final thing to make sure of is that your gloves are tough on the outside. If you fall, you don’t want to scratch up your hands. When choosing cycling gear, do not forget your helmet. In most places, it is considered a law that you must wear one. It is also a safety precaution. If you fall, you don’t want to get a head injury. Make sure that your helmet has reflectors, especially if you plan on riding at night. This will allow other people to see you properly. Now that you know what gear you need, it’s time to discuss the bike itself. Buying a mountain bike can be overwhelming. There are a lot of types to choose from. However, there are some basic questions you can ask to get you started. The type of bike you choose is dependent on your riding style. Where do you plan to ride? What kind of terrain are you expecting to ride on? These factors will dictate the type of bike you pick. There are several different types of mountain bike on the market. It is important to know what differs from each one. For that reason, we are going to list the types here, along with their key advantages and disadvantages. Trail bikes are one of the most common types of bike, due to their versatility. Unlike other types, these bikes aren’t grounded in any style of racing. Trail bikes are excellent if you just want to meet up with your friends at the trailhead for a ride. They are good at both climbs and descents. Furthermore, they combine fun with sensibility and have a good overall weight. Specs are as follows: 120-140 MM suspension travel and 67-69 degrees of head tube angle. What do these specs mean for you? Suspension travel is the amount of movement offered by the bike’s suspension and head tube angle is the angle of the bike’s head tube to the ground. This angle indicates how well your bike will climb. The steeper the angle, the faster it turns and the better it climbs. However, lower angles mean that your bike is more stable, and may be better for beginners. Are you a speed demon? Do you want a bike that can keep up with you? If so, a cross-country mountain bike may be for you. Cross-country bikes emphasize speed and climbing ability. Distances ridden on cross-country bikes tend to vary between a couple of miles to twenty-five or more. For that reason, these bikes tend to be very lightweight and are perfect if you plan on getting into competitions. Typical specs on a cross-country bike are 80-100 mm of suspension travel and 70-71 degrees of head tube angle. Fat bikes have oversized tires. This type of tire gives them excellent traction, especially in sand, snow and other hazardous terrains. The wide tires also make them excellent for beginners. People who are first learning to ride do not always know what is safe to ride on and need forgiving tires that will grasp most surfaces. The style of riding preferred by all-mountain bikers can be likened to the extreme sports version of trail riding. The climbs are bigger and more challenging. The descents are longer. There are more technical features. All-mountain bikes are designed to perform well on steep descents while being light enough to pedal your way up the next hill. Typical specs on an all-mountain bike are 140-170 MM of suspension travel, 65-68 degrees head tube angle. Downhill bikes are ridden at lift-serviced bike parks. They are big and tough, and their riders wear full-face helmets and body armor. The reason for the extra precautions will become clear if you ever see one of these bikes in action. Their riders encounter berms, jumps, wooden ladders and all sorts of obstacles and trick scenarios. The typical downhill bike specs are 170-200+ MM suspension travel and 63-65 degrees head tube angle. There are a few types of specialty bike on the market that also need to be mentioned. Just like their name suggests, folding bikes are capable of folding up. This means they will fit into a smaller space than a regular bike. For example, it is perfectly possible to put a folded bike into the back of the family car, just as you would with folding strollers. On the surface, enduro bikes look like any other bike. They borrow technology from other forms and disciplines of biking. This can all be confusing. However, the best way to think of it is that enduro is like a cross between cross-country and downhill. Therefore, enduro bikes must be tougher than regular cross-country bikes. However, they aren’t required to be as tough as a downhill bike would be. 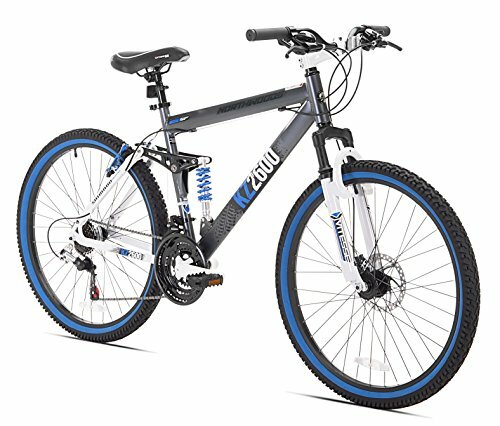 Electric mountain bikes may seem like electric cars. They may also seem just silly. However, in truth, an electric bike is just one that assists you when you pedal. If you aren’t pedaling, it is exactly like any other bike. When you pedal, however, a throttle and motor kick in to help you a bit. This can be important the next time you’re trying to climb a huge hill. No matter which type of bike you buy, there are some features that you need to consider before you choose. Such things as suspension type, wheel diameter, frame material, number of gears and brake type are all important considerations. There are several types of mountain bike suspension. The suspension is the force that absorbs trail bumps. Rigid mountain bikes have no suspension. They’re much easier to maintain and are some of the best budget bikes. Fat bikes are often rigid. They don’t need suspension as the wide tires provide enough squish to cushion you from bumps on the trail. Hardtail bikes have suspension forks in the front to absorb impacts on the front wheel. However, as their name implies, they do not have any rear suspension. Hardtails are less expensive than full-suspension bikes and much easier to maintain as they have fewer moving parts. Most of them even have a way to lock the suspension fork for those times when you want something rigid. 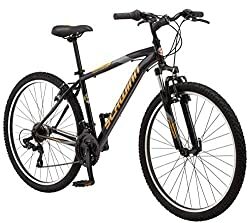 Cross-country riders tend to prefer these bikes as more of the pedal stroke is transferred to the rear tires, and they are excellent in all but lift-serviced park scenarios. There’re a lot of variations on full suspension, but the general idea is the same. With these bikes, you have a front suspension fork and rear shocks to absorb trail impacts. This absorption translates to less impact on the rider, more traction, and an overall smoother ride. However, there are also disadvantages. Though a full-suspension bike can absorb a lot of the bumps, it can also bob a bit. This means you lose some of your power transfer when pedaling uphill. For this reason, most full suspension bikes will allow you to lock out the rear suspension so that you have better power transference. There was a time, not so long ago, that all bikes designed for adults sported 26-inch wheels, and it’s still an available wheel size. However, it’s no longer the only size. 27.5-inch wheels take a middle ground approach. They are more maneuverable than the 29ers and roll over terrain much easier than the 26’s. 29-inch wheels are found in both full suspension and hardtail bikes. A 29er is a bike with 29-inch wheels. These bikes take a little more energy to reach acceleration. However, when they do, they can hold their momentum for a longer period. This makes them very useful for long-distance cross-country riding. Also, a 29-inch wheel has a higher attack angle. This means it rolls over obstacles far better than the smaller wheel types. Furthermore, this wheel type works on all kinds of suspension and not just the hardtails and full suspension. If you see a + symbol after your 27.5-inch wheel size, it simply means that the tires are wider by at least two inches. Wider tires offer a lower rolling resistance, so the trend these days is toward wider tires. Most kids’ mountain bikes have 24-inch wheels to accommodate their shorter legs. These bikes also have simpler components. 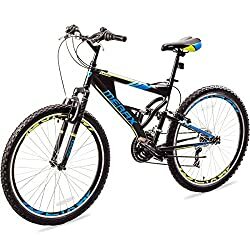 These bikes tend to be good for children ages ten-thirteen. However, this recommendation is based on the size of the child more than the age. For smaller or shorter children, there are bikes which have 20-inch wheels. The frame of your bike influences a lot of factors. Just some examples are weight, longevity, price, and strength. Therefore, choosing your frame material is very important. This material is the most common thing to make a bike frame from. However, there are high-end bikes whose manufacturers are more careful what metals go into their alloys, making them the lightest bikes out there. Steel frames are tough, inexpensive and provide a great ride. However, they tend to be quite heavy. Titanium is very lightweight and strong. However, it is too expensive for all but the very high-end mountain bikes. The final frame material is carbon fiber. Carbon fiber is extremely durable and light. However, the process of making it quite labor-intensive. This intensiveness makes the finished process more expensive. You often find carbon fiber on cross-country bikes and fat bikes. Mountain bikes have gears. You can tell how many gears a bike will have by multiplying the number of front chainrings by the number of sprockets on the cassette. A bike can have one single speed, or it can have up to thirty or more. For simplicity sake, the amount of gears you need depends on the terrain you’re riding and your fitness level. If you are going to be climbing lots of steep hills and you’re just beginning, you’ll need more gears than someone who is a strong biker or someone who only rides on flat terrain. The fewer the gears, the lighter your bike will be, so bear that in mind before choosing. Mountain bikes traditionally come with two or three chainrings to give you a few gears for climbing. However, these days, ones with single chainrings and wide-range cassettes with nine to twelve sprockets are popular. Singlespeed mountain bikes will give you most of the gears you need. However, if you find you need more, gearing modification after the fact is relatively easy. One of the primary considerations when buying a bike are the brakes. After all, you will at some point need to slow down and stop the bike. Disc brakes have a brake pad that grips onto a rotor mounted on the wheel hub. They come in two versions: hydraulic and cable-activated. Hydraulic brakes offer stronger braking with less finger effort. They also self-adjust for brake pad wear. Cable-activated brakes, on the other hand, must be manually adjusted for brake pad wear. Easier to replace a rotor than a hole wheel when things wear out. It is more difficult to look at the pad wear of disc brakes. Hydraulic brakes are more expensive to service. Some entry level bikes come with rim brakes instead of disc brakes. As their name suggests, these feature brake pads that grip onto the wheel rim. Replacing worn pads is easy. Wears out the wheel rim eventually, causing you to have to replace a wheel. More finger effort to brake effectively. Not good in wet or muddy conditions. Mountain bikes, like clothing, come in various sizes. These are S, M, and L and they are similar across brands. Getting the proper pick of your bike is important. Most manufacturers even provide size charts to make this easier for you. If you are between sizes, go for the smaller size. There are more modifications that can be made to a smaller frame than there are for frames that are too large. If you are going to buy a mountain bike, you need to know how to care for one. Proper maintenance can increase the life of your bike. Check your tire pressure. While you are at it, check for damages. Check your brakes. You don’t need them to fail when you’re going downhill. Check your gearing. If something feels off, it probably is, and it’s a good idea to check. Check your shifting. If the shifting feels off, your wheels might not be seated properly. Check your chain. If it skips, you might have a frozen link which needs lube. Check your pedals. Make sure they’re clean and dirt-free and that you can get in and out of them easily if they’re clipless. Check your fit. If something feels off, it might be time to adjust the height or saddle. Never ignore a noise on your bike. If there’s a noise, you need to investigate it. Check your screws and bolts. Make sure they are all tight but try not to over-tighten them. Check your skewers or axles. Make sure they are tight. Check your bike for cracks, especially if you crashed on your ride. Small cracks can be catastrophic. Check your drive train, brakes, and other components. It’s better to know now that you need to service something than before you take that next ride. Clean your bike. Where you live, and the terrain you ride will dictate how often you need to wash it. Don’t forget to clean your suspension stanchions. It’s important to take care of your forks and shocks after a ride. Lube your drivetrain. Wipe off your chain and lube it up. Service your bike. This should be arranged in late winter or early spring before the biking season gets going. Now you know what sorts of bikes are out there and how to care for one. However, buying a bike can still be overwhelming. That is why this section exists. 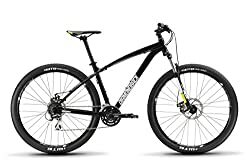 We will review the top 9 best mountain bikes for 2019, to give you a bit of an idea of what’s truly out there. The Shimano is one of the hybrid bikes, and also one of the best mountain bikes under $200. What is a hybrid bike? A hybrid is a bike that is designed to ride on several different terrain types. It is a cross between a road bike and a mountain bike, meaning you could ride it to work. 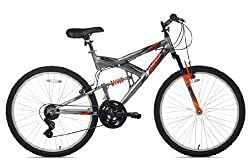 This one has a lightweight aluminum frame and a suspension fork for comfort while riding. The wheels are 27.5 inches, and the brakes are mechanical. This bike is also quite fashionable. It’s a bike you could just as easily ride to work as on the trails. Do you want a bike that will last for years, a bike that will handle anything you can throw at it? If so, then check out check out the Kent Thruster Duel-suspension bike. The frame is rugged aluminum, and it has a revolutionary floating beam suspension system married to a suspension fork. To make sure you can go anywhere you want, the bike also has a 21-speed gear set. This means it will handle hills well. The wheel size is twenty-six inches, which may be a problem for some people. However, putting new wheels on is not a hard feat. Also, be aware the brakes on this bike are front disk breaks only. There is no back brake. Do you need a mountain bike that is equally as comfortable on the road as off it? 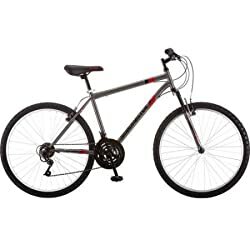 If so, the Granite Peak men’s bike is a great choice. It features an aluminum frame, linear pull brakes, and a padded seat for extra comfort. The suspension fork will smooth out the bumps, while the rugged tires grasp both dirt and pavement. There is some minimal assembly. Attaching the handlebars, pedals and suspension fork is necessary. If you do not know how to do this sort of thing, you will want to find a good bike shop. Beyond that, this is an excellent bike for the price. The instruction manual is detailed and easy to follow. Kids love mountain bikes too. If you want to get your child started early, this is a great bike. It comes with 24-inch wheels to accommodate their shorter legs. Beyond that, however, it’s just as good as an adult’s bike. The frame is made of aluminum, and the full suspension means this bike will ride as smooth as butter. For climbing hills or any other sticky spot you might get yourself into, the Northwoods features 21 gears. This makes it quite versatile. This bike, unlike most on this list, has a front wheel that attaches to a skewer instead of bolts. That’s a good thing, considering that the bike comes 85% pre-assembled. The frame is heat-treated aluminum, for extra strength. If you want to use it on any advanced trails, however, you will need an aftermarket suspension fork. Also, do bear in mind that this rig is a hardtail. If you’re used to full suspension, it might be a bit rough at first. However, because it is a hardtail, it is much lighter than other bikes. This may just be the best 29er mountain bike on the market. However, do be aware that it is a bit heavy. Also, this is not one of the dirt jump bikes. Instead, it is more for casual cross-country riding. The frame on this bike is very strong and will last for years. As a child, you possibly had a Schwinn. They are like the household name in road bikes. However, will their mountain bikes hold up as well as their road bikes do? The short answer is yes. This bike may be one of the best mountain bikes under $500. The Schwinn has an eighteen-inch frame with 27.5-inch wheels. Though it may look beefy, it isn’t that much bigger than a regular bike. It has twenty-one speeds, seven speeds on the right and three adjusters on the left. The handlebars are slightly small, but they do have a place to put your water bottle, as well as space for a few add-ons. Do be aware of the weight. This is a steel-frame bike so that it will weigh about 40 pounds. Are you looking for a 29er? Do you want one of the best bikes under $1,000? Look no farther than this one! 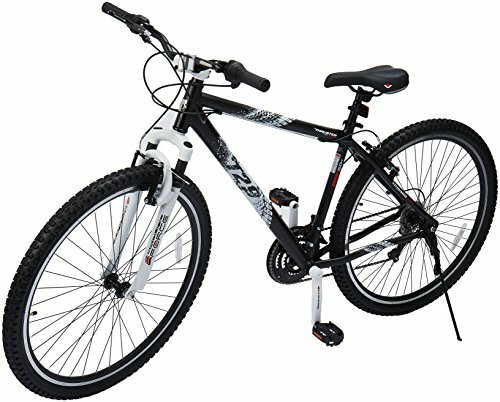 The frame of the bike is aluminum alloy, and the 29-inch wheels mean that you’ll roll over terrain without difficulty. There’s plenty of traction, so feel free to scale that hill. This bike also has amazing control and feel. The bike is a hardtail, which means that it’s lighter than other bikes. However, the tires on this bike, along with the front suspension, give you enough comfort that you won’t mind the bumps. Assembly is a breeze. You don’t have to do anything but put on the front wheel and the pedals. The brakes and gears are all set and tuned in to you. 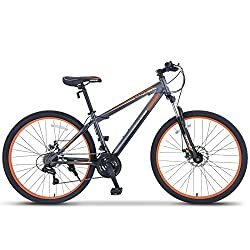 This bike is great for beginners to intermediate riders. It features a lightweight, heat-treated aluminum frame. The wheel diameter is 29 inches. This bike will travel over bigger holes than a bike with smaller wheels will. It comes 85% assembled. However, you will need a few tools. Mountain biking is a wonderful way to get out and see the sights. It’s also an excellent form of exercise. However, buying your mountain bike can be difficult. There are so many things you have to keep in mind. You also have to consider what gear you need. What type of pedals your bike has will affect your shoe choice, for example. With this article, we have endeavored to take the hassle out of mountain bike purchases. Now you have all the information you could need to not only buy the bike but care for it afterword. Now, it is up to you. It’s time to take that step. Your bike shop is calling. The day is beautiful and sunny. It’s time to go out and buy the bike of your dreams.